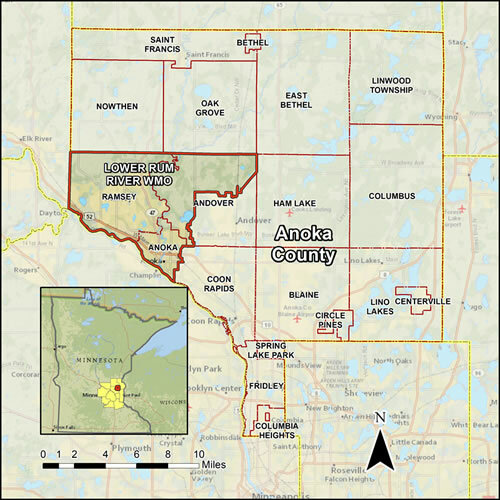 The Lower Rum River Watershed Management Organization (LRRWMO) is a joint powers special purpose unit of government including the cities of Ramsey, Anoka, and portions of Andover. All of the WMO's activities are guided by their Watershed Management Plan. Resources of particular importance to the LRRWMO include the Rum River, Trott Brook, numerous ditches that drain to the Rum River, Round Lake, Lake Itasca, and numerous wetlands. The Mississippi River is also notable, as it borders the southern edge of the WMO's jurisdictional area. Because little of the land area in the LRRWMO drains directly to the Mississippi, but rather to the Rum River, the Mississippi receives protection from the WMO primarily through management of the Rum.